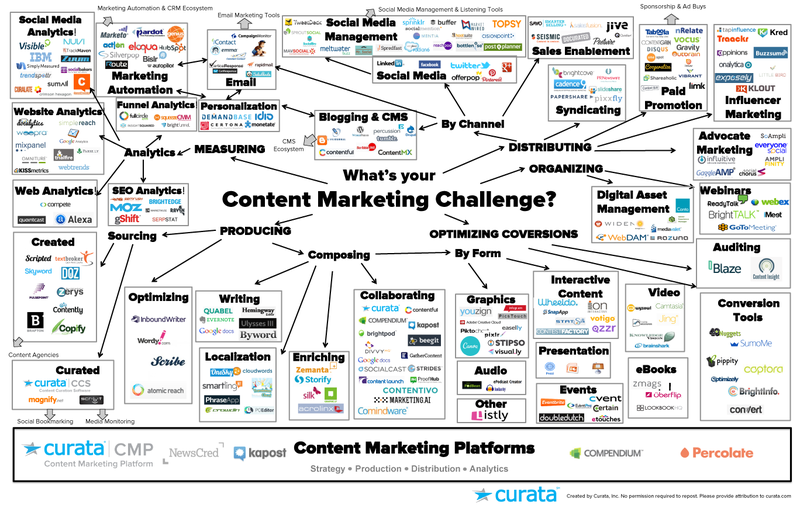 Curata has created a map of content marketing tools to help guide you through the many content marketing tools and technologies available to find the one that best fits your needs. This list has been updated as of February 21, 2017. Of particular note is the continued emergence of the Content Marketing Platform category. I have pieced together this graphic over time, but few could keep up with the rapidly evolving space of content marketing tools. Here are some disclaimers and areas where things could be better. It’s not complete. I am sure there are entire categories missing here. I hope you will recommend and suggest additional content marketing tools for this map in the comments below. Silverpop – A digital marketing platform that unifies marketing automation, email, social media, and mobile. Marketers can carry conversations across multiple devices and measure return on relationships. Resonance – Retargets content for your audience. Keep your messaging upfront by tracking what your site visitors are viewing and making them aware of more relevant content. Mr. Social – Schedule and manage social media updates across several platforms with this tool that also suggests posts for your target audience. Offerpop – A social media platform for businesses to recruit, engage and convert customers. Contentivo – A management system that’s great for collaborating across teams. Allows team members to give feedback, track versions, and eventually publish and analyze content.